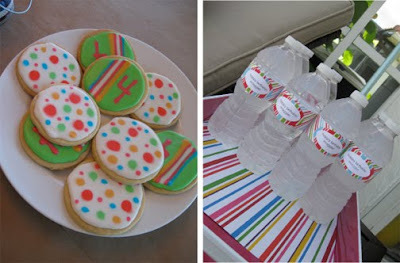 Ruth submitted this sweet poolside party for her daughter Maggie and I was amazed when she told me it cost less than $150 to put together (including the babysitter!). To keep her party on a budget, everything was a DiY project... from the banners and pom poms to the baked goods, colorful labels and party hats. 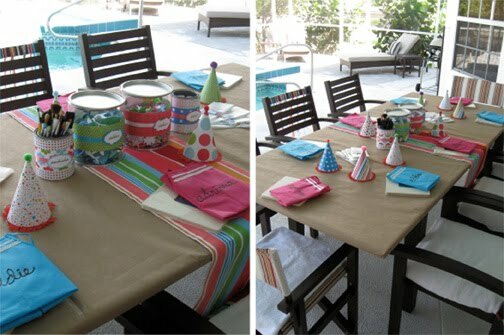 Ruth wisely covered the tables with kraft paper and as a craft project had the kids create wooden frames in 2 stages. The kids painted the frames, the went swimming while the paint dried, then decorated the painted frames with underwater-themed foam stickers. A simple project, but perfect for the short attention span of 4 & 5 year olds... she even personalized aprons for them to wear while painting and take home as favors! So creative! I love this! 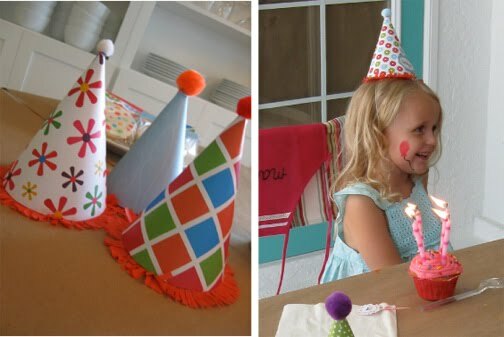 Too cute of party hats...adorable! I adore the color scheme for the bash! Not the typical girly! What a cute party. 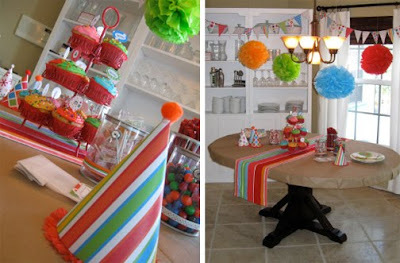 I particularly love the party hats!! !